One key highlight was seeing a woman I met at VMworld 2 years ago present a session this year. Sonya Ryherd from Cox Automotive did a session with her colleague, Chris Nakagaki, called, Introduction to Monitoring the Public Cloud with vRealize Operations Manager. They did a great job. It was one of those sessions where you walked away knowing something you didn’t know before. I was very intrigued and learned even more about what vRealize Operations could do. I’m installing it ASAP! It’s very invigorating to walk away from the conferences with a renewed sense of direction and passion in what I do. Along with finding out about the new technologies and direction they’re headed, you discover features, flings, tips and tools that you’ve never knew existed. That’s like finding the prize in the cracker jack box. You knew it was there, but you didn’t know what that little gem would be. The 1st things I’ll do when I get back to the office. 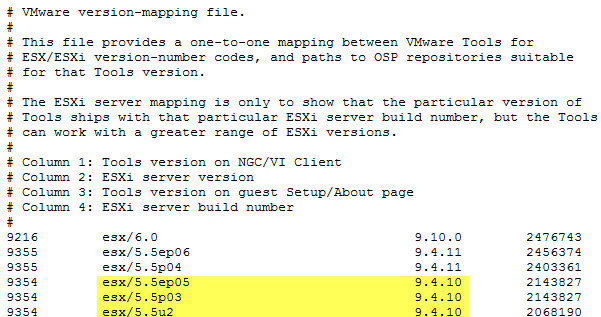 Plan for the upgrade to vSphere 6.0. Upgrade tools to v10 before the sphere upgrade. 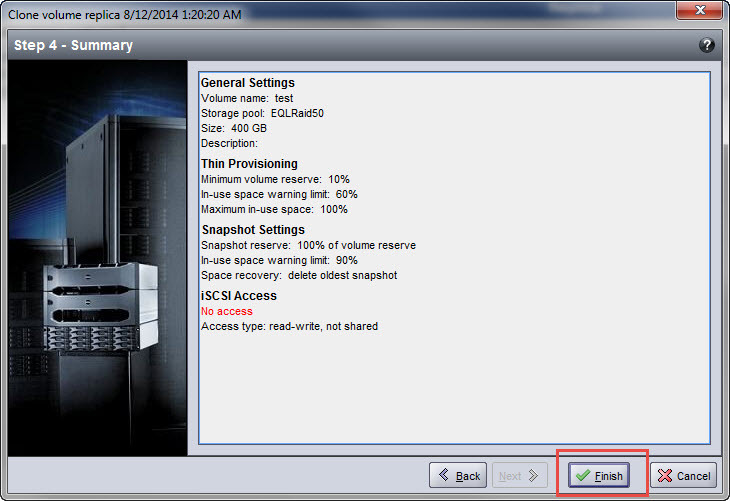 Deploy my ESXi lab in the cloud using Ravello & get ready for the VCP6 exam in 2016. And got plenty of t-shirts and swag to drag back to the east coast. I have a ton of photos, but I’ll post just one. One sad note about the conference….I’m sad that It’ll be in Las Vegas next year, but I’ll try to be there. I’m not a woman that likes Hades very much. See you next year (maybe)! 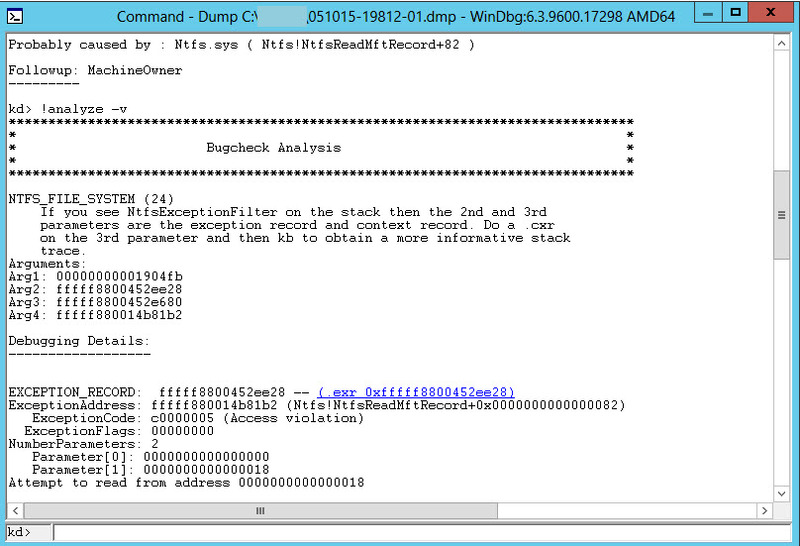 A VM that is running Windows 2008 R2 has experienced a BSOD. The application owner notified me and sent me some useful information. Good info here, but with all BSODs, you should look at the dump file for more definitive information. 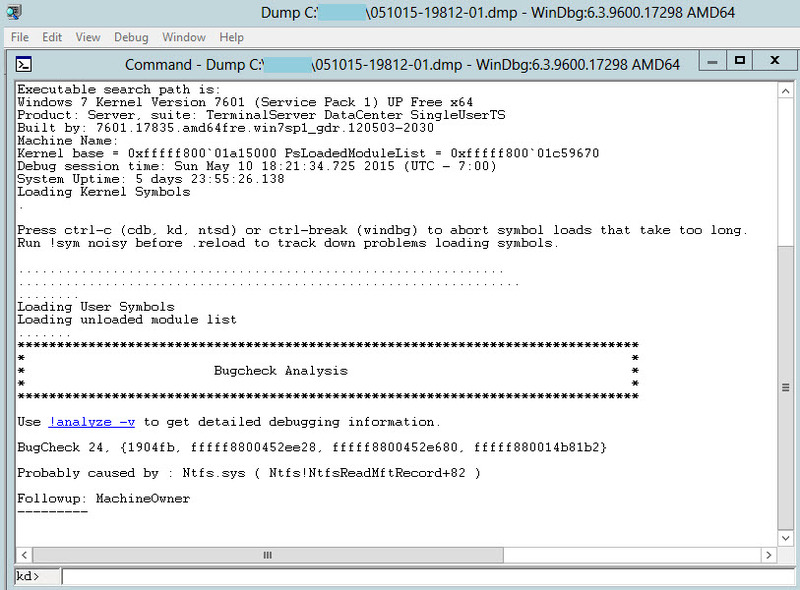 I grabbed the dump file, and downloaded Windows SDK. 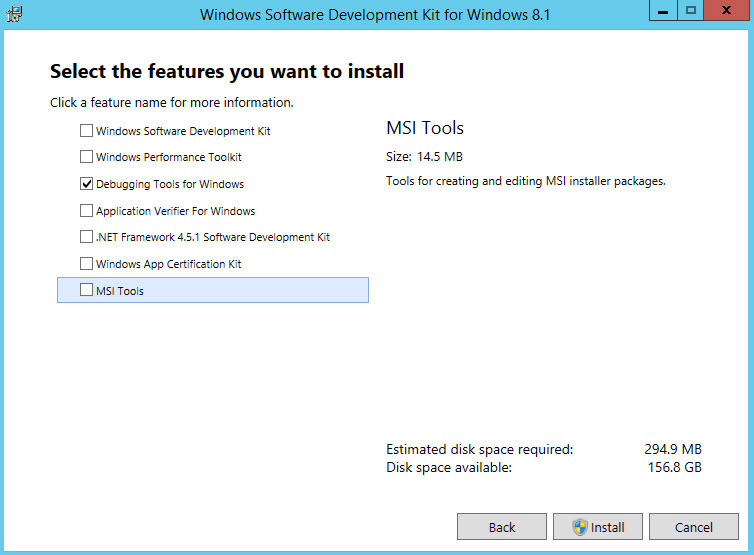 During the install, I unchecked all the boxes except the Debugging Tools for Windows and installed. Launch WinDGB (x64) as administrator. The first step is to configure the symbol file path. It can be any folder on your server, just create an empty one and go to File > Symbol File Path. In the symbol search path, I entered the following and clicked OK. Opened the dump file. File > Open Crash Dump. Before you proceed, read the info under the bugcheck analysis. It tells you what probably caused the error. Click the link in the Bugcheck Analysis section, !analyze -y to get more information. At the very top you’ll see a message and some arguments. In the analysis you see the Arguments. Do a .cxr on the 3rd argument as it suggests. Run the kb command for a more informative stack trace. There are now a few pieces of information to hone in on. Look up the bugcheck code here on the msdn bug check code reference page. 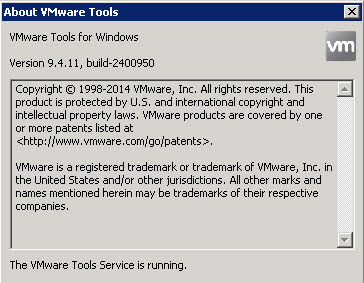 Google the stack trace text and this vmware KB article # 2115997 comes up. 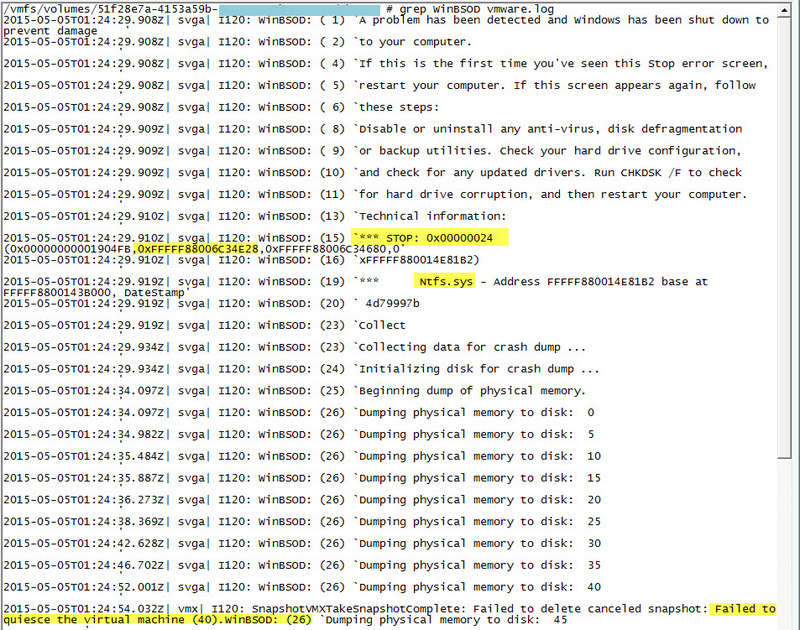 I looked in the vmware.log file for the entries mentioned and they matched. Find the tools ISO that will have a version that is not listed in the KB, but one that is compatible with your version of vsphere. Search for your current version and find the one closest to it that is not affected with this issue. You’ll have to uninstall the current version of tools before installing older version. It will require a reboot. The hardware version will not be an issue with this versions of tools, but confirm that for your specific environment. When you’re updating the firmware on EqualLogic arrays, this is also a good time to update the firmware on the hard disks as well. Check the recommended hard disk drive firmware on the eql support site (login required). 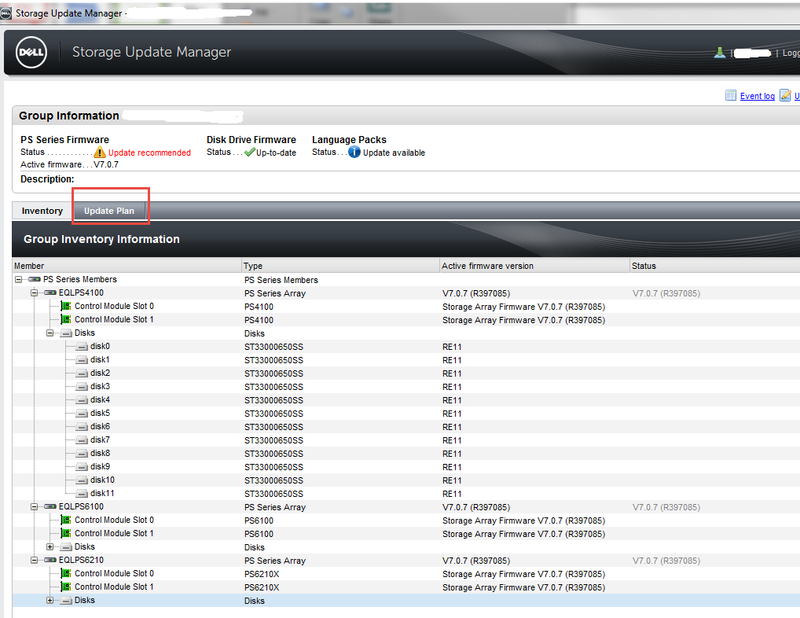 Compare your hard drives revision number against the ones listed under the ‘affect hard drives’ section of the page. 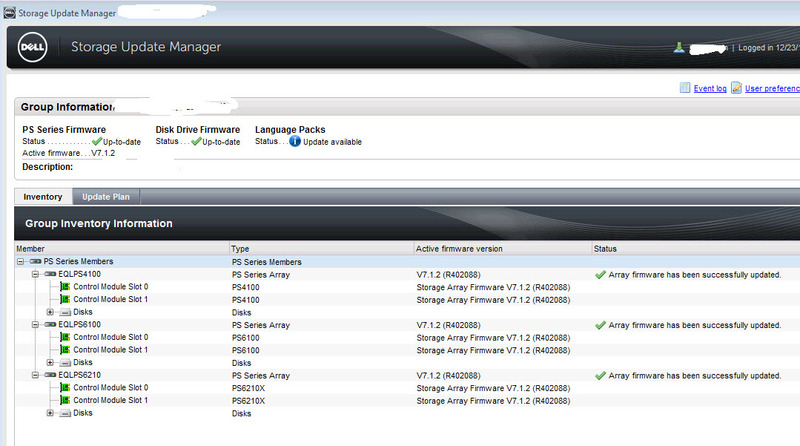 Open either group manager or San HQ and review the current firmware revision. In group manager, Group + Members + Array + Disks tab. 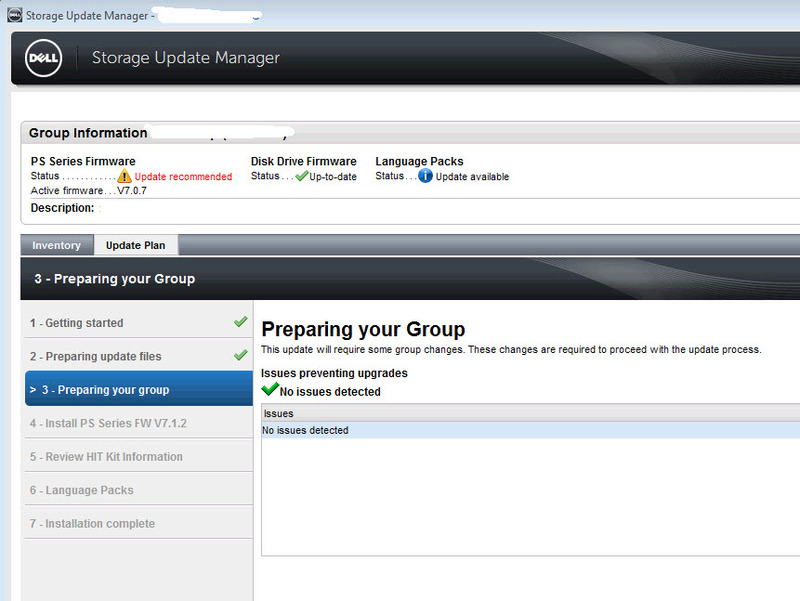 If you find your disks drives require a firmware upgrade, plan to update. Open the connection to the array via IP or hostname and log in with an account that has admin privileges, like grpadmin. Change to binary mode and ‘put’ the kit_vxxxx_DriveFW_xxxxxxxxxx.tgz file on the array. Once the transfer is complete, close and bye. Now, SSH into the array and begin the update. Type ‘update‘ and confirm that you’d like to proceed with the update. Depending on the number of drives in your array, this will only take a few minutes. 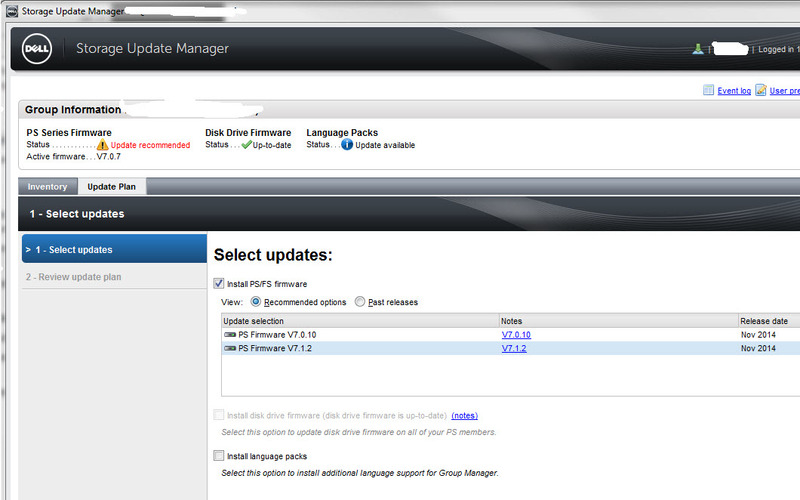 Check group manager or SAN HQ and confirm your new hard drive firmware version. 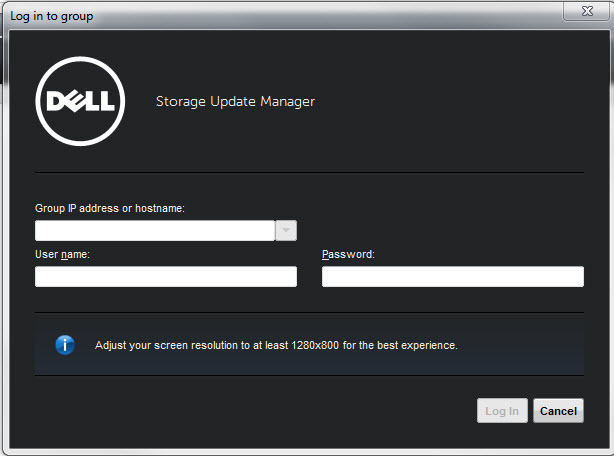 The Dell Storage Update Manager (DSUM) is a great new tool that makes updating your array firmware, drive firmware and language packs easier. Launched summer 2014, this application that can be installed locally or ran remotely via a java based app, is your new recommended way to update your groups. To use it, you must be running at least v5.0.0 PS series firmware or FS series firmware 3.0.0 or higher. This wizard will walk you through assessing the current state of your groups and guide you through the updates step by step. 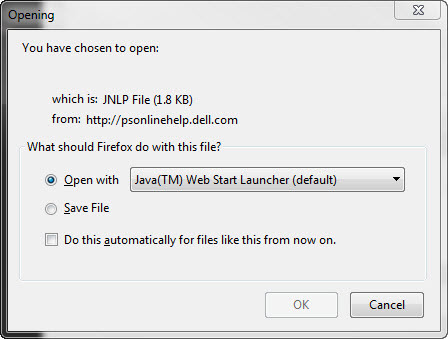 and open with Java web start launcher. Log into your group with administrative credentials. 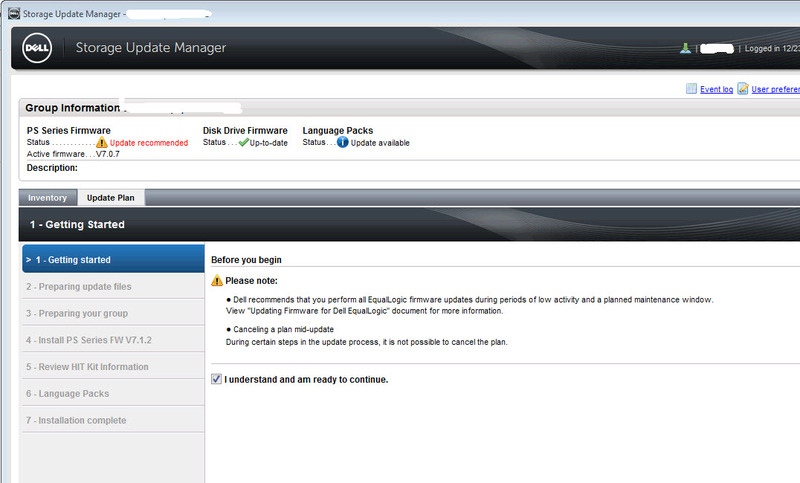 Once logged in, you can review the status of your group firmware, disk drive firmware and language packs. Click on Update plan to being the update wizard. Here is where you select the updates to be installed. Review the updates you’ve selected. The Update plan summary will give you an estimated time for the updates to completed. On the getting started screen, you’ll get a quick reminder to perform the update when their is low activity and during a pre-planned maintenance windows. Check the box to confirm you understand the ramifications. 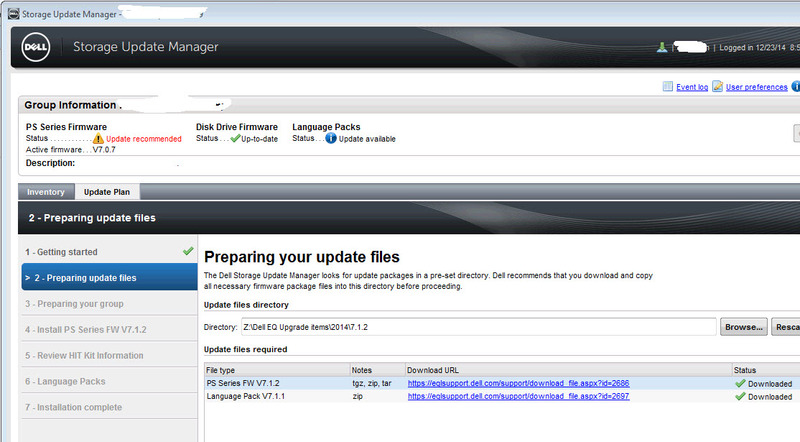 Upload the files needed to update your array, drives, and language packs. 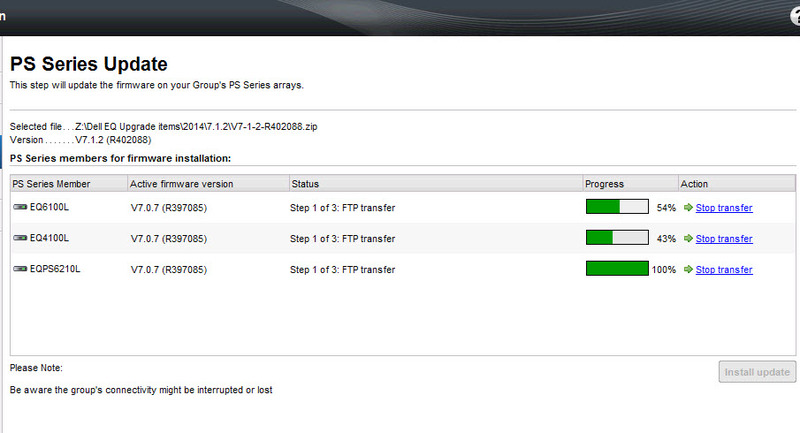 The next screen in the wizard is the 1st step in updating your array’s firmware. 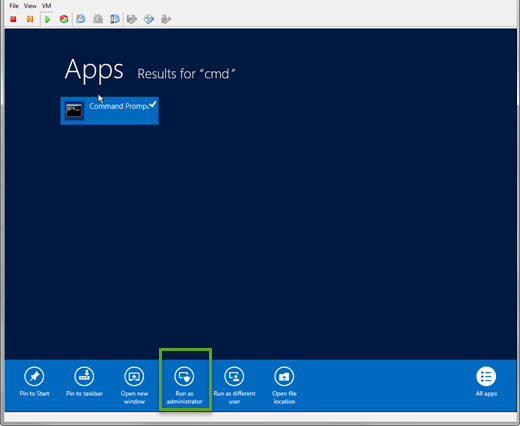 Review the information and click install update. The installation begins and will display the progress and the current status. you can also review this information in group admin under group operations. 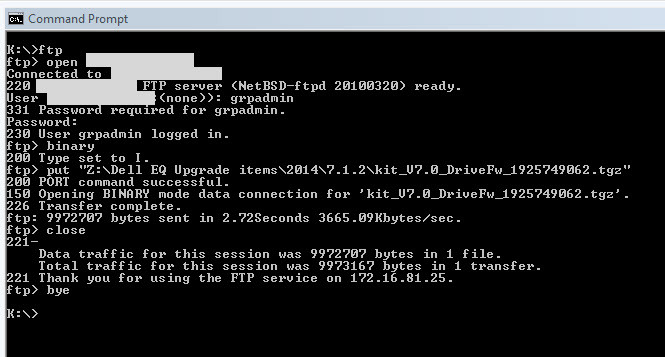 The 1st step is the FTP transfer of the zip file to the array. The 2nd step is the actual update. The 3rd step is the update pending restart. Once the update is complete and pending a restart, click ‘restart’ to proceed. You’ll be warned about the restart and it’s ramifications. Repeat for each array. The update is complete. The HIT Kit compatibility screen with remind you to confirm that all EqualLogic software in use in your environment is at the versions listed. 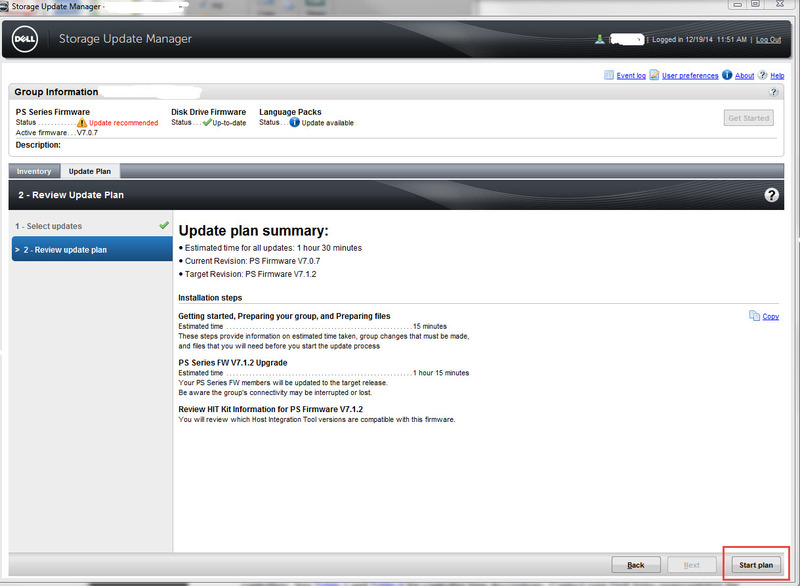 Once all installs are done, you’ll get the ‘installation complete’ screen that summarizes what took place. This is my 3rd year attending VMworld and each time I walk away with a renewed focus and energy for my virtual infrastructure and what I can do to better manage and improve it. As I’m writing this post, I’m scrolling through my tweets and notes from VMworld and what stands out is that for my organization, VMware has the tools an SMB needs to deploy, monitor, upgrade, backup, administer, BD/DR, and grow its virtual infrastructure with ease. My schedule was filled with sessions that covered just the things I needed to hear and to use day-one when I’m back in the office. Using the schedule builder as soon as it was available gave me time to make smarter choices and decide where my time should be spent in a more efficient manner. 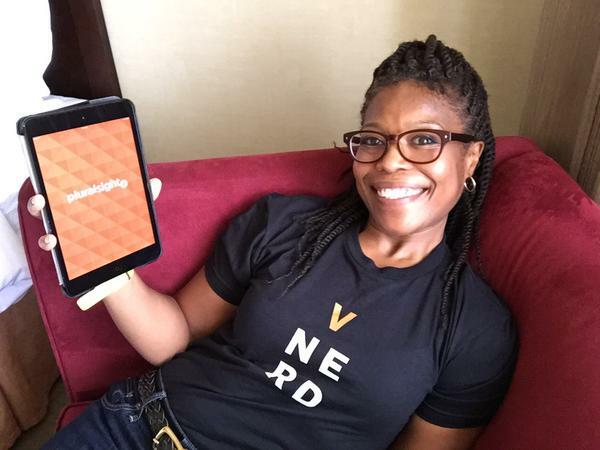 The VMworld app was a life saver! I knew right where I was suppose to be with notification turned on. The social media section keep me abreast of all the #vmworld tweets easily. Here are my 3 favorite sessions. The sessions that made me want to roll up my sleeves the minute I had a WiFi connection to VPN back into the office and ‘test’ something out. It was invaluable to hear what happens in REAL SMB IT shops. The feedback and questions were very helpful. There were several moments of applause. I’m surprised they didn’t get a standing ovation. All around great information and they pointed out specific caveats when upgrading that can be overlooked. I got to spend a lot of time looking at what vendors are bringing to the virtualization space. Software, products and services that are moving VMware forward as the leader. The Games at the CDW booth were more fun than I expected to have on opening day. The trivia questions were thought provoking and the ‘game show host’ and his assistant really kept us laughing. Winning a scooter (razor type) from Ravello and terrorizing the Moscone Center. 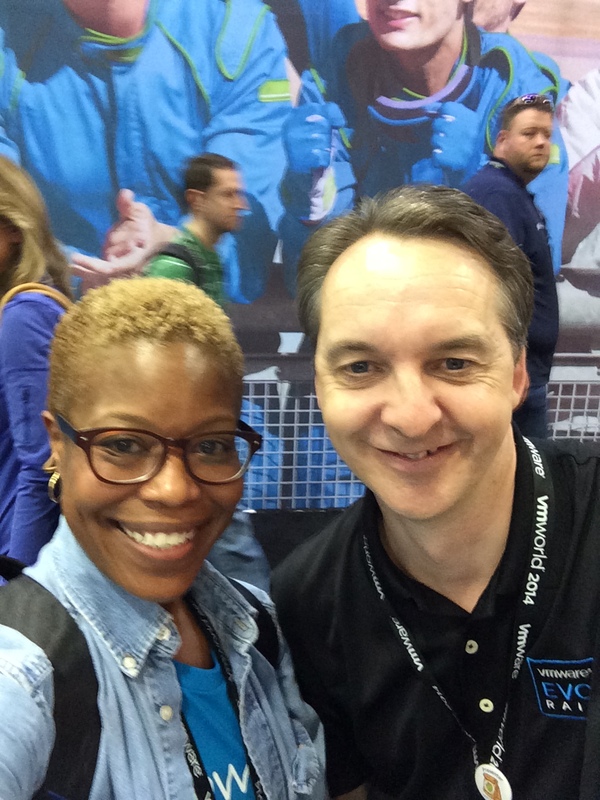 Taking a selfie with my SRM mentor, Mike Laverick of VMware. The volume of the music at the Monday General Session was deafening. I really didn’t understand why the AV people didn’t rectify that by the end of the keynote. I promised myself I wouldn’t listen to another GS in the Hall D. The hang space was just fine. I was in just ONE session with a woman speaker and I think she was a vendor. ‘Nuff said. I know they’re trying to accommodate those with dietary restrictions, but vegetarians do need protein too. 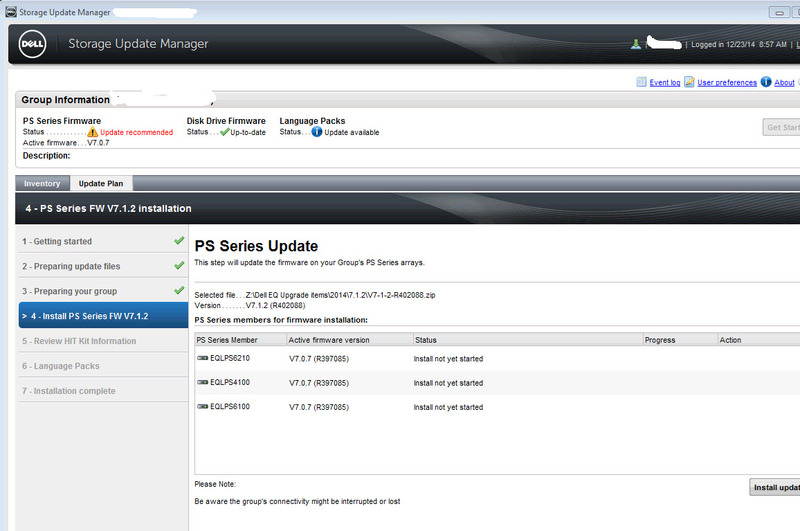 Now that I’m back in the office, I’m ready to, upgrade to vSphere 5.5, tweak SRM and test out the vSphere 6.0 beta. I can’t talk about it (NDA), but you can find out more about it here. Here is a really good overview of the 1st general session at VMWorld 2014. Great things on deck. 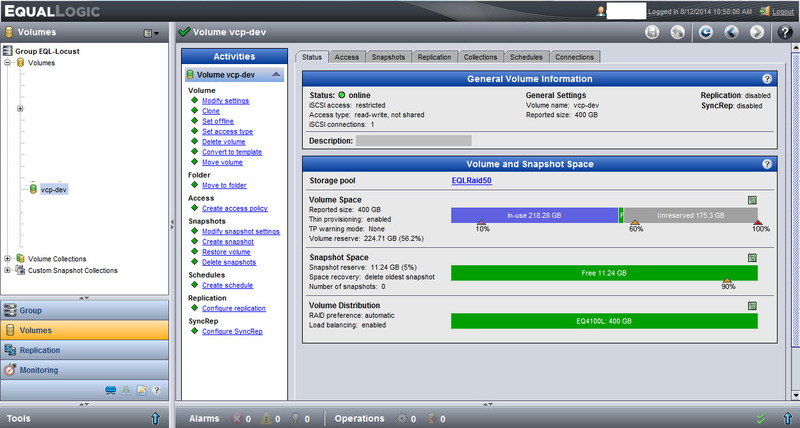 VSphere 6.0 Beta & SRM have my full attention. I have a dev server that’s my sandbox for VMware VCA studying. This Dell PowerEdge 2900 is on it’s last leg. It has an iSCSI disk that houses a bunch of ISOs, installers, docs, etc that is being replicated to another EQL array. The old PE is located behind my desk and is loud as a 747 taking off when it powers up.I will NOT miss this thing at ALL! I have a new PowerEdge R420 that I’ve moved my development environment to and it lives in an offsite data center. I want my iSCSI disk attached to my new server, but I don’t want to stop replication on my current disk until the server is wiped and hauled off. The beauty of EqualLogic is their arrays are wonderfully easy to administer and makes any takes relatively easy. Since the disk is replicated and I don’t want it to stop replicating right away, but still would like to have the current data to use and access immediately on my new server. 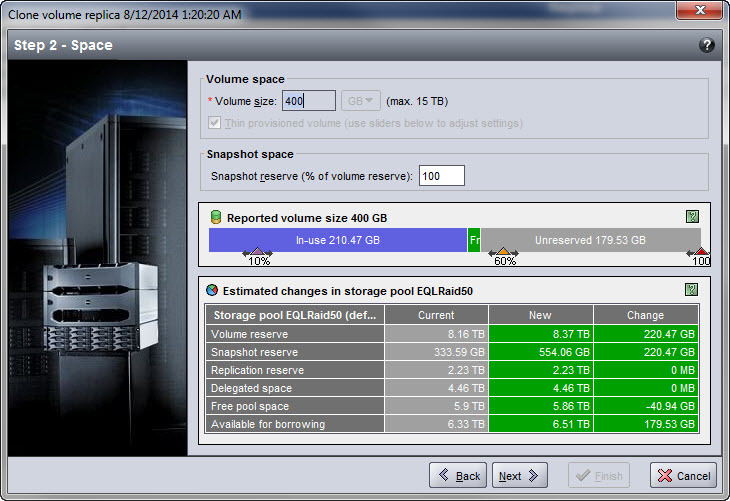 Yes, I could have mapped a drive, but if the 2900 dies, I’m still up and running without even a hitch. That’s where cloning an inbound replica comes in. From the outbound group manager, make sure you’ve replicated your volume. From the inbound group manager, Go to replication and expand inbound replicas. Select your replica so the information appears in the right pane. Click clone replica. The wizard will guide you through the process of cloning your replica. On step 2, change the snapshot reserve if you need to. Step 4, review the summary and click finish. Your new volume will appear in the volume list. Present it to the new server if you didn’t during the clone volume replica wizard and you’re in business. 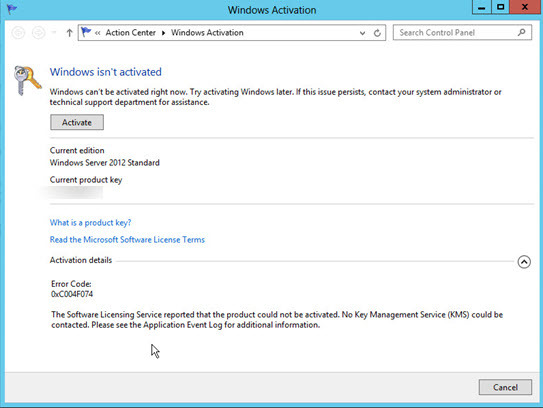 It appears the default activation in Windows Server 2012 is KMS. Since I’m a primarily a 2008 R2 shop and this is my first ‘real’ 2012 server, I was waiting for the prompt to activate it with my MAK key, but when I clicked Activate, it gave me an error about KMS. The quick way to activate your server with MAK is to Open a command prompt and run as administrator. replace the Xs with your MAK Key and hit enter. Your copy of Windows Server is now activated. It will be difficult, but not impossible to get more women in tech. I’m very hopeful about the prospects.